This module is not used at every show. When it is used, it adds capacity to the main yard, and also provides extra flexibility in the configuration of the display. Without it, the yard would be a straight 20-foot run. 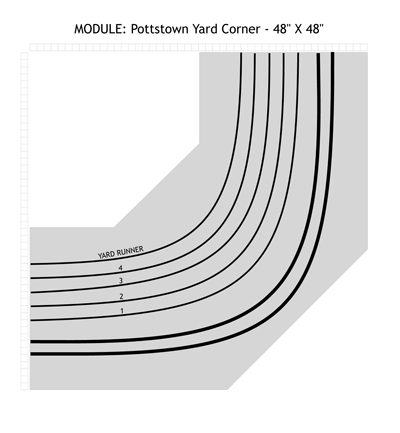 With corner modules at each end, that would make our minimum display length 28 feet, but by "bending" the yard around a corner, the length of the display can be about half that long. In large displays, this corner also makes the yard look more interesting. 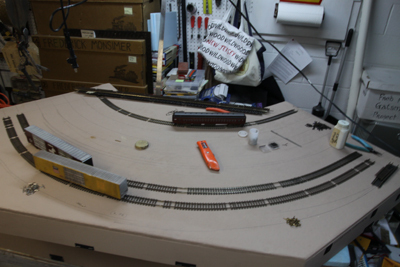 The Pottstown Yard Corner under construction.